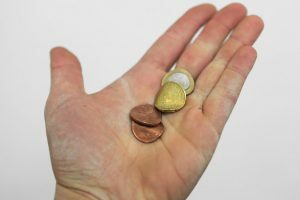 If the exhibition takes place in an organisation selling objects, drinks or whatever, bended coins have to be put in the cash register and used as normal money. Even if modifed, coins get back into their flow and classical use. At Platforms Project in Athens: All three of us had a modified coin in a pocket and showed it to many people around. Finally one spent it at the bar, one sold it as an art-object (doubled the value) and one just gave it away.